Levre de Cuppi is an authentic traditional Ligurian apartment with terrace in the heart of Monterosso. 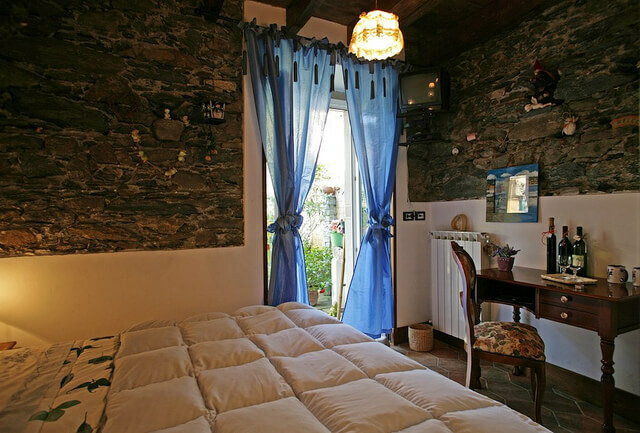 Comforts and tradition get along in this charming property to offer a welcoming solution to get the most from Monterosso village. Levre de Cuppi is located in the very heart of the ancient part of the village, in the original ancient nucleus and most typical area called “Buranco”. Entrance is from a small green wooden door under a stone porch. Under this porch most of the front doors hide old private cellars. In these cellars barrels, bottles, nets and fishing tools mingle. They witness the true essence of this land. That is sea and land joined together in the ordinary life of its inhabitants. Levre de Cuppi is a third floor 2-bedroom apartment with terrace developing on 2 levels, going all up. It unwinds on stairs, as if the architect, as often happens in the Cinque Terre area, wanted to use all the gaps left by the rocks. Passing the main door we find 2 flights of stairs (33 steps). A door and other 2 flights of stairs (18 steps) takes us to a higher floor. We meet here a large kitchen and dining room. The kitchen and furnishing are all new and quality is high. Walls have soft colours wallpaper. The kitchen is complete, with refrigerator and stove oven. No dishwasher nor washing machine, but there’s a laundrette in the village. From the kitchen we have access to a small bathroom with shower handle. On the other side of the room we enter a charming bedroom, elegantly furnished with a double king size bed. A window door leads us to a wonderful terrace with an evocative view on the typical roofs and vineyard hills of the Cinque Terre. Romantic tents will shade it, offering a peerless relax area. Imagine yourself here at night sipping a delicious glass of wine with your loved one. (Pictures portray balcony without tents, since they have been take during winter time with works in progress). From the dining room we have wooden staircase that takes up to an under roof loft dedicated to a cosy bedroom with a queen size bed and a small brass porthole. Levre de Cuppi apartment has air conditioning in all the rooms and from 2017 offers free wifi. Levre de Cuppi is an excellent solution for families with children who want to be close both to stores and beaches. Its terrace is a precious outdoor. It also a great apartment for rental for couples who want to enjoy the very best of the village life with a romantic atmosphere.